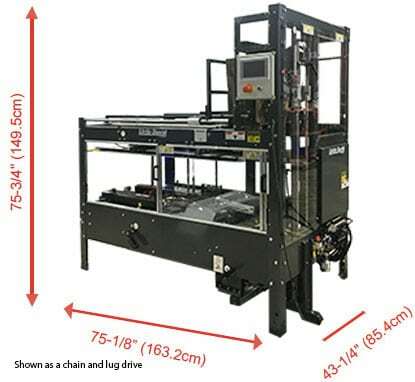 The CF-25 industrial grade, high-performance carton erector machine from Little David is designed to form and bottom-seal corrugated cases at speeds up to 15 cases per minute. Small Footprint- Patented case flow technology allows the CF-25 to maintain it’s versatility without compromising your floor space. 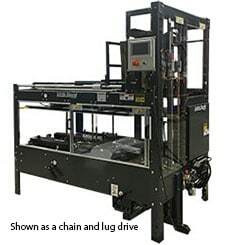 Chain and Lug Drive- Chain and Lug drive system ensures a square case is formed and eliminates box stalling and slipping. Quick/Easy Changeover- Load-on-the-fly/easy load hopper ensure case loading and changeover are simple and efficient. Standard: Up to 10 cases per minute. High Speed Option: Up to 15 cases per minute, depending on case size and corrugated quality.